A story on Page A1 in some editions Saturday incorrectly reported that a jury found against Dr. Gary Thompson and Dr. Michael Turner in connection with a 1998 child abuse case. The jury actually found in favor of both doctors. The story to the right reports the correct information. The Star apologizes for the error. 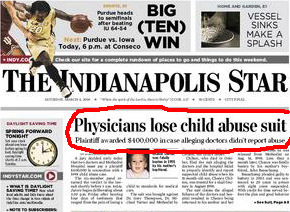 the correct headline was Hospital found liable in child abuse suit, and the headline on today's story was Jury: Doctors not liable in child abuse suit. this is almost a dewey defeats truman-level mistake. it's impossible to know how many people saw that headline and got the erroneous impression that the doctors had been found at fault, damaging their reputation. i wouldn't be surprised if they sue, but for the star's sake i hope they don't. Actually it was not just that the headline was wrong. The article stated that the doctors were found liable, named them (again) and went to lengths to explain it all. This is a shocking lapse of journalistic standards that undermines the integrity and credibility of the media as an institution.